Notable alleged blown calls: Mets-Dodgers, July 6, 2011; Mets-Dodgers, July 7, 2011; Angels-Red Sox, October 11, 2009 (Game 3, ALDS); Phillies-Astros, August 23, 2010. Claim to fame: For taking a Stephen Strasburg fastball straight to the junk and living to tell the tale. [From 2007 to 2009], Gibson would be described as one of the best hitters' umpires in the game. ... But in 2010, he saw a lot more strikeouts and dramatically fewer runs; only James Hoye had a lower R/9 for the year. ... If you accept ejection rate as a valid reflection of an umpire's temperament, Gibson's career 3.3 percent rate, 50 percent higher than the norm, doesn't bring the word "best" to mind. I was looking through old video footage from some of last years games and found something interesting. Anyone who remembers that Saturday Nite Twins game where Greg Gibson robbed us of an opportunity to tie the game with his horrendous call at 2nd base to end the game. 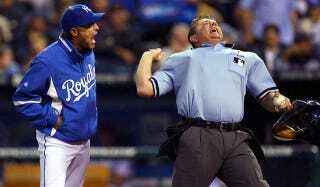 After reviewing I feel Greg Gibson should NEVER be allowed to ump a ROYALS game EVER!!! This is the same Jackass who threw out Zak Grienke for arguing balls and strikes from the dugout and he also warned both benches when Anthony Larew threw a CURVE ball that didn't even hit the Red Sox Mike Lowell. This guy clearly hates and has a zero tolerance policy on the Royals Franchise!!!! 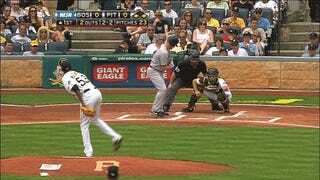 Sample PITCHf/x strike zone: September 24, 2009. Royals ace Zack Greinke wasn't even pitching when Gibson tossed him for arguing balls and strikes. Looking at this pitch map, it's clear what ticked him off. True fact: Was the first umpire to field a manager's request to review a home run via instant replay. It happened on September 3, 2008, when Rays skipper Joe Maddon asked Gibson, the home plate umpire, to review an Alex Rodriguez home run that hit the Tropicana Field catwalk. The crew looked at the video and the call was upheld. On umpiring: "We all make mistakes, but I assure you as a baseball fan I give you my very best every time I step on the field."